Sabyasachi just gave a magnificent collection of lehengas. 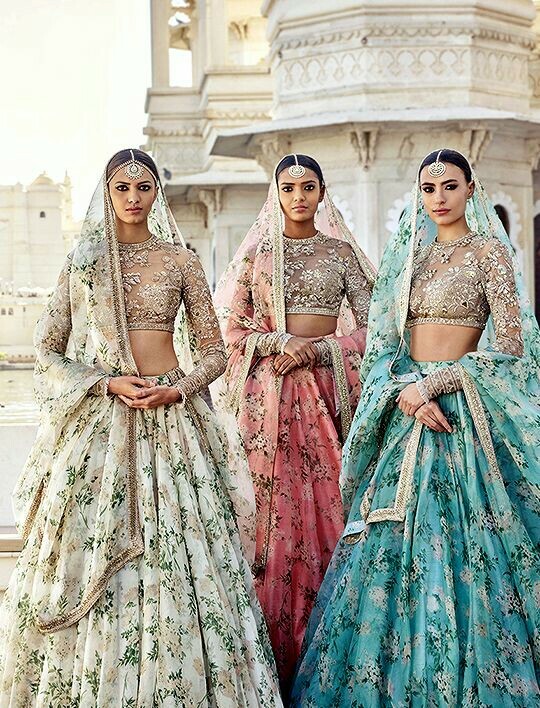 This huge collection is the dream of every bride that has now come true and this is all because of the most renowned designer Sabyasachi Mukherjee. Really it has to believe that Sabyasachi has magic in his hand otherwise no one can bring out such an awesome creation. Each and every single piece is unique and every design has its known aroma. All the lehengas are drool-worthy. Here is some splendid set of collection that is ready to steal your eye. This is definitely going to give you a nostalgic feeling. This is lavishly designed and is hand embroidered with silk floss, beaten silver thread and studded with semi-precious stones, beads and pearls. Rich indigo and Iranian turquoise velvet lehengas intricately embroidered with zardosi, appliqué, pearls and crystals. Beauty at its peak! The groom won’t be able to take his eyes off the bride. The lehenga is beautifully embroidered on Bordeaux silk with hand-dyed velvet appliques, silk-floss, beaten silver and gold thread and rose-tinted crystals and rhinestones. The look is accessorized with jewellery from the Sabyasachi Heritage Jewelry Collection and romanticized with a sheer, diaphanous, embroidered veil completing the look of a traditional Indian bride! I bet we would definitely be seeing a Dil Guldastan Sabyasachi bride in the near coming weddings!! This peice is definitely going to increase the temperature with its awsomenawes. Inspired by Mughal miniatures and Benarasi Meena, this lavish lehenga is embroidered with silk floss, antique zardosi and semi-precious stones and pearls. The lehenga is framed with a museum-quality zardosi border featuring elephants and foliage with three-dimensional relief. All these lehengas are once in a lifetime creation and will stay forever.